where Q = S0/4 is the flux of the short-wave solar radiation at the upper atmospheric boundary; S0 is the solar constant; Ts and TA are values of the absolute temperature at the underlying surface (in the case of the ocean surface 7¡ is equal to 7\ or T0) and at the mean level in the atmosphere; y is the short-wave radiation absorption coefficient; v^ and v* are upward and downward long-wave radiation emissivity; v is the coefficient of long-wave radiation absorption; aA is the atmospheric albedo; o is the Stefan-Boltzmann constant; as before, P is the amount of precipitation falling per unit area of the underlying surface per unit of time. where C9 is a dimensional constant; the composition of precipitation is identified by the temperature of the underlying surface: if it is less than the water freezing temperature Tso then it is snow that falls, otherwise it is rain. where <?al = J\q'aX + (1 - f\)q°u qa2 = f2q\2 + fxq\2 + (1 - f2 - f\)q°2 are the average (within the limits of southern and northern boxes) values of specific humidity at some fixed level (say, at p/ps = 0.9985) in the surface atmospheric layer; superscripts L, I and O correspond, respectively, to the air surface layer over land, sea ice and ocean; k21 and k22 are numerical constants. Over any type of underlying surface qa can be found using the expression qa = raqm(Ta), where qm(Ta) is the maximum specific humidity defined by the Clausius-Clapeyron equation; Ta and ra are the temperature and specific humidity at the level p/ps = 0.9985.
where fi.d is the numerical factor equal to zero as T\ > 273 K, and 1 as T\ < 273 K.
We now consider the heat fluxes Qf appearing in (5.5.3), (5.5.5), (5.5.9), (5.5.10), (5.5.19) and (5.5.24). We discuss the flux Qj of the short-wave solar radiation absorbed by the underlying layer, as well as the net flux Q\ of the long-wave radiation at the underlying surface, and eddy fluxes of sensible Q% and latent Q\ heat. 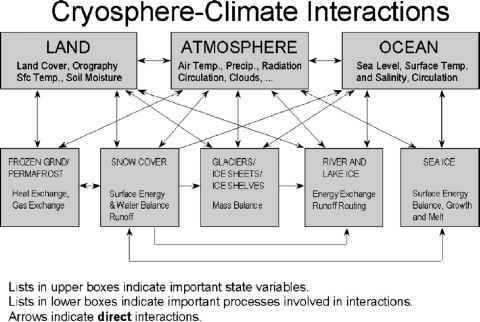 Let us represent them in the form where c1 = dqm/d|i|r=7-a, c2 = (1 — ra/rs)qm(Ta); as is the albedo of the underlying surface; C„ is the resistance coefficient; pa is the air density.